Light Work’s Urban Video Project presents CULTURE CAPTURE:TERMINAL ADDITION by the New Red Order (NRO), an Indigenous artist collective. The NRO’s core contributors are Adam Khalil (Ojibway), Zack Khalil (Ojibway), and Jackson Polys (Tlingit), and they use video and performance to collectively challenge European settler and colonialist tendencies—such as “playing Indian”—with what they call “sites of savage pronouncement,” the purpose of which is to shift potential obstructions to Indigenous growth and agency. Light Work commissioned CULTURE CAPTURE: TERMINAL ADDITION for UVP and the New Red Order created this work during their month-long visit to Syracuse in December 2018. 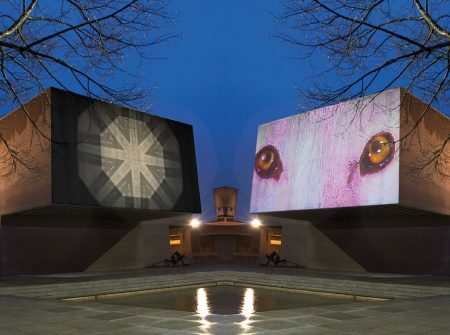 The piece will be on view at the Urban Video Project’s architectural projection site on the north facade of the Everson Museum through April and May 2019. The artists will also be here for a special screening, lecture, and moderated conversation on, April 18 at 6:30pm in the Everson Museum of Art’s Hosmer Auditorium. The auditorium is wheelchair accessible, and the event will offer CART services for hard of hearing audience members. The screening and Q&A are FREE & OPEN to the public. We will serve light refreshments after the program. Half tongue-in-cheek absurdism and half deadly earnest, CULTURE CAPTURE: TERMINAL ADDITION continues the New Red Order’s ongoing project of “culture capture,” recruiting viewers to participate in a program of practical strategies to counter the “salvage mindset,” which sets aside Indigenous culture and sovereignty by consigning it to the past, thereby removing it from the present. These strategies include using new, accessible technologies, such as smartphone apps that produce 3D scans of objects, both of Indigenous material that museums and other institutions may hold and public monuments that celebrate the ideals of a region’s European settlers. As the title of the work, TERMINAL ADDITION highlights the difference between addition and removal. The concept of “removal” is central to current debates about whether to remove problematic historical monuments— for example, Confederate war monuments in the South. It was also in the name of the Indian Removal Act, signed into law by President Jackson, which resulted in the displacement and death of thousands of Native peoples in what we now call the “Trail of Tears.” Both present removal as a quick fix. With TERMINAL ADDITION, the NRO recognizes that acts of removal inevitably contain contradictions, and proposes an additive approach instead. NRO virtually captures objects and then subtly alters and repurposes them. The resulting spectral projection transforms their meaning and “repatriates” them. With CULTURE CAPTURE: TERMINAL ADDITION, the New Red Order order invites viewers to join Indigenous Peoples as cultural accomplices. The stakes are high: in the face of impending ecological catastrophe and unprecedented global inequality, the futures of Indigenous Peoples are bound up with a livable future for all. Shot in and around Syracuse, TERMINAL ADDITION uses local archives, collections, and locations, including the Columbus Monument in downtown Syracuse, the Saltine Warrior on the Syracuse University campus, as well as Syracuse University’s archive of the work of James Earl Fraser, the artist who created the widely known End of the Trail and Indian Head Coin. This project was made possible through the support and collaboration of the Syracuse University Art Galleries, CitrusTV, S.I. Newhouse School of Public Communications, and Special Collections Research Center. Adam Khalil (Ojibway) is a filmmaker and artist who lives and works in Brooklyn. His practice attempts to subvert traditional forms of ethnography through humor, relation, and transgression. Khalil’s work has been exhibited at Lincoln Center, the Museum of Modern Art, Sundance Film Festival, Walker Arts Center, and Whitney Museum of American Art. Khalil has received various fellowships and grants, including Flaherty Professional Development Fellowship, Gates Millennium Scholarship, Sundance Art of Nonfiction, Sundance Institute Indigenous Film Opportunity Fellowship, and UnionDocs Collaborative Fellowship. Khalil received his BA from Bard College. Zack Khalil (Ojibway) is a filmmaker and artist from Sault Ste. Marie, Michigan, currently based in Brooklyn, NY. His work often explores an Indigenous worldview and undermines traditional forms of historical authority through excavating alternative histories and innovative documentary forms. He recently completed a B.A. at Bard College in the Film and Electronic Arts Department, and is a Gates Millennium Scholar and UnionDocs Collaborative Fellow. The Khalil brothers’ acclaimed debut feature film INAATE/SE/ has screened at museums and in festivals around the world. Jackson Polys (Tlingit) lives and works between what are currently called Alaska and New York. His work examines the limits and viability of desires for Indigenous growth. He began carving with his father, Tlingit artist Nathan Jackson, from the Lukaax.ádi Clan of the Lk̲óot K̲wáan, and had solo exhibitions at the Alaska State Museum and the Anchorage Museum before receiving a BA in Art History and Visual Arts and an MFA in Visual Arts, both from Columbia University. He taught at Columbia (2016-17) and was advisor to Indigenous New York with the Vera List Center for Art and Politics. Jackson received a 2017 Native Arts and Cultures Foundation Mentor Artist Fellowship. His individual and collaborative works reside in collections of the Burke Museum, Cities of Ketchikan and Saxman, Field Museum, and the Übersee Museum-Bremen, and have appeared at Artists Space, Hercules Art/Studio Program, James Gallery, Ketchikan Museums, Microscope Gallery, and the Sundance Film Festival. 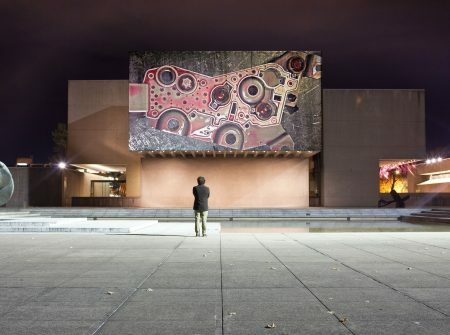 This exhibition and event continues UVP’s 2018-19 programming year, The Past Keeps Happening, featuring artists who explore the complex interactions between remembered past, imagined future, and lived present through various practices and strategies, from raiding the archive, appropriating, remixing, and repatriating – to memorialization, homage, and re-enactment. This exhibition was supported by the New York State Council on the Arts with the support of Governor Andrew M. Cuomo and the New York State Legislature.